The best Superman stories are usually the most straightforward. This meat-and-potatoes mentality has been one of the great strengths of Geoff Johns’ tenure on Superman. While his scripts haven’t been the most groundbreaking works starring the Last Son of Krypton, they have still served as rousing, character-centric tales that have engaged audiences and critics alike, making Kal-El’s solo title a part of the larger comics conversation for the first time since its New 52 debut. Even if you haven’t been following the current arc, “The Men of Tomorrow”, Superman #35 spins an easy-to-read tale that is coupled with some truly great artwork from some industry titans, culminating in a solid issue from a book that has been often overshadowed by other Superman family titles. Picking up directly after the cliffhanger of the previous issue, Superman #35 finds our titular hero and his new partner in the field, Ulysses, tracking down the Machinist in order to get some solid answers and possibly a bit more. Johns’ new Superman analogue Ulysses has been a very interesting inclusion so far in his run of Superman, starting out as a potential antagonist and evolving into a sort of pupil of Supes as he struggles to come to terms with his own power and limits as he makes his way in the world. Throughout Issue #35, we see Ulysses go from remorseful avenger to an idealistic despot, with Johns constantly supporting his actions with surprisingly convincing dialogue. John has always had a knack for presenting antagonists that seem like the heroes of their own stories, and Ulysses is another great example of this trope. Ulysses is a man who was raised in a utopia who sees the potential for the same thing on Earth, and while Kal-El shares his idealism, he understands the nature of humanity better than Ulysses ever could, which deepens the mentor/mentee relationship that Johns has built over this arc as well as stoking the fires of animosity for later issues. Superman #35 is a welcome change of pace from the overblown, event-heavy plotting we have seen from Johns in the recent past. In keeping with the straightforward plotting, Johns employs the talent of possibly the most straightforward artist of all time, John Romita, Jr., along with his long-time inker Klaus Janson and colorist Laura Martin. While Romita’s workman-like renderings and wide cinematic panels work well here in the pages of Superman #35, particularly in the scene where Ulysses and Superman storm the Machinist’s tanker base of operations, it is colorist Laura Martin that provides the issue’s real artistic spark. When we last saw Romita take on a monthly title, Marvel NOW’s Captain America, he was aided by Janson and colorist Dean White, who gave that book the gritty, hardened feel it needed. On Superman, however, Martin’s colors have brought out a whole new look to Romita’s blocky and sometimes stilted-looking panels. Though Superman still isn’t as bright as I would like it to be, Martin’s bolder color choices as well as her use of shadows and lighting effects finally distinguishes Superman as a title with real artistic ambitions instead of more of the same from a big name. Going back to the issue’s main set piece, Martin employs several examples of stark, piercing lighting effects to cut through the bleak rainstorm that she drowns in heavy grays, greens, and blacks. Superman’s heat vision slices through the background like a hot knife, the Machinist’s machines peer from the darkness with eerie green eyes, and Ulysses grim vision of humanity’s obsession with weapons shines through the page like a grim beacon of shrill yellows. Even if Romita’s artwork isn’t your thing, and I know several people who are very vocal about that very opinion, Laura Martin is bringing out the best in him and herself on Superman and that is more than worth a passing look. Superman has been used in a myriad of ways narratively in the last few years. He’s been a tool used to deconstruct the very medium. He’s been the fresh face of whole new DC universe. He’s been the head of a whole new Justice League for a whole new generation. However, its as the star of solid comic book plotting that he truly soars. We don’t call him the Big Blue Boy Scout for nothing and Superman is finally that book again. Geoff Johns, John Romita, Jr., Klaus Janson, and Laura Martin deliver a no-frills, easy-to-pick-up story with Superman #35 that makes no illusions about its place in the Superman canon nor does it try to overreach and be something important. It is simply a story about a hero trying to be the best that he can, and that is more than enough. For me, the original Onslaught was all about the action figures. It was the first line-wide “event” comic I remember being exposed to, and the fact that there was this single villain, an amalgamation of the altruistic yet Machiavellian X-Men founder Professor X and the despotic but deeply convicted Magneto, whose power was such that challenging him took the combined strength of the entire Marvel Universe (and thereby, my entire collection of Marvel action figures) blew my young, impressionable mind. '90s comics get a bad rep for being all sizzle with only marginal amounts of steak, but the mind of a 10-year-old isn't inclined to notice the distinction. The imagination is fed, either way. This red-and-purple helmeted bastardization of Charles Xavier's dream provided an excuse to play with all of my toys together, which was all I needed. 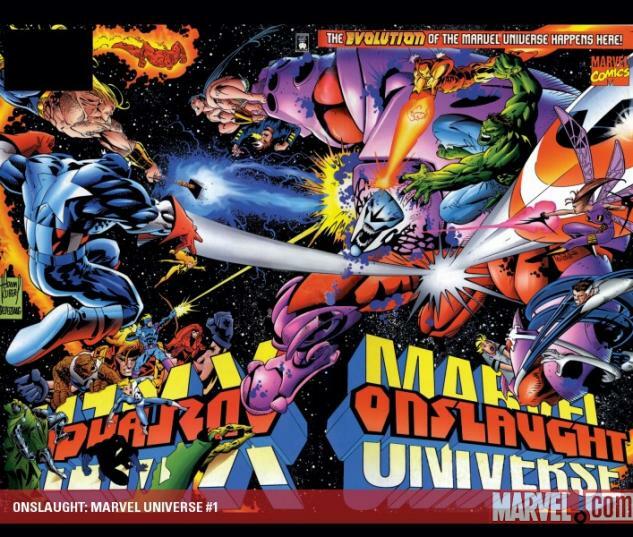 Adam Kubert's cover to Marvel Universe: Onslaught #1 would be forever burned in my brain as the standard by which all blockbuster comics'-crossovers would be measured against. Maybe it was only sizzle, but it made for an aroma I'd never forget. Now, the much-maligned Onslaught character has been revived, this time as a marrying of the original character with iconic Captain America and Avengers villain, the Nazi-riffic Red Skull. This “Red Onslaught” just wants genocide, and to destroy anything and everything in his way. Some bad guys just want to watch the world burn, I guess. So once again, the diverse heroes of the Marvel Universe must band together to save it. Only, they aren't quite up to the task. Two issues into AXIS saw the combined powers of Earth's Mightiest Heroes and mutantkind's best and brightest defeated, downcast, and, basically, totally screwed. Genocidal apocalypse makes for strange bedfellows, though, and in issue 3, reinforcements arrive, by way of Marvel's deep stable of famous antagonists. Magneto, Dr. Doom, Loki, Carnage, (Kid) Apocalypse, Deadpool and more are all somehow playing the role of cavalry, and more surprising still, manage to save the day. As a kid, I only thought to use the hero toys to battle Onslaught. It seemed sensational at the time, but now I realize what a fool I was, neglecting an entire half of my collection! I don't... I don't know if this story makes any sense. This issue's resolution sees the Avengers and X-Men at odds, once again, with erstwhile Uncanny Avengers captain Havok playing the “turn” role that Spider-Man once played in Civil War. I'm not sure the story earns that turn, or that the conflict is plausible under any logic other than that Red Onslaught might somehow still be using Xavier's telepathy to influence the tension between groups (which is complete conjecture and which the story does not indicate in anyway). I also don't... I don't know if I care? I don't know that I need the story to make all the sense? Because Rick Remender's script is punchy and occasionally hilarious. His characterization of the villains in this issue is so fun and light, capitalizing on the bad guys' charisma and the farcical nature of their unlikely altruism. It's an entire series of Odd Couple moments. Remember when the 9/11 tribute issue of The Amazing Spider-Man came out, and people mocked the fact that John Romita, Jr. depicted a weeping Dr. Doom amid the New York City rubble? This issue is like one long parody of that panel. You're left rooting for the baddies, because as Deadpool points out to the stone-faced Iron Man, the heroes are kind of being dicks. Leinil Yu and Gerry Alanguilan's linework is suitably scaled for this variety of blockbuster, capturing the massive cast distinctly while the end of days commence, in the background at times. The story may have plausibility issues, but the visuals never do, and the team of colorists that tackle this issue manage a tonal consistency throughout. There's obviously a lot of action to be shown, but the narrative clarity remains uncompromised. If you “muted” this story, you would lose a lot of Remender's high points, but you'd easily get the gist of things. AXIS #3 marks the end of The Red Supremacy, Book One of the crossover. We've seen the wheel turns on its, y'know, axis, and now the bad guys seem good and the good guys seem maybe not as much. This series doesn't seem like a deep exploration of heroism in the Marvel Universe, or a particularly well-reasoned conflict between two teams of heroes. It's just an excuse to dump all of Marvel's toys out of the toybox, and play with them. Thematic justification of the fun is this story's last priority. It's just a lot of stuff going on, a lot of players on the board. I'm okay with it - you don't go to White Castle trying to order the ribeye. Sprouting from the events of Batman Eternal, Selina Kyle just isn't the Queen of Crime of Gotham, she's officially a mob queen. While she still manhandles chumps with her trademark bullwhip, Selina is more Boardwalk Empire's Nucky Thompson here than Diabolik with even Batman telling her "this isn't you." The funny part about that? This actually does work. Selina has made quite the evolution here and coming from Ann Nocenti's unsatisfactory run, it's sort of a small miracle that Ms. Kyle has her lives all intact. Novelist Genevieve Valentine brings to Selina's world a breath of fresh air, that still has an essence of a crime novel. Selina here is less backtalk and quips and more serious business with gravitas that a character with her type of legacy deserves. Valentine gives this new direction a complete 180, but it remains a jumping on point for new readers. Though, there might be a tiny veil of confusion as to why she's suddenly the HBIC that might baffle readers who aren't picking up Batman Eternal or dropped this book out of spite, but the story picks up easy and you get a quick gist on her world now. So. Garry Brown. For people who aren't picking up Image's Five Ghosts let me get you up to speed: Brown is straight-up great. His gritty style fits Selina's new environment with sketchy linework and bold inks. Brown still carries on with Selina having a vague aura of Audrey Hepburn, but gives her a more hardened sense of self and body language. Also, his visual take on this side of Gotham combined with her Valentine's voice almost gives the book an old school Vertigo feel; it just feels right with the given tone. His stylized take on Black Mask and how he's once again positioning himself as Selina's rival is another solid takeway from this issue. It would also be difficult to not mention Lee Loughridge on colors here. He's taken essentially his palette from Deadly Class and transplanted in here. Moody blues and murky flats give Selina's Gotham a haunting and dangerous tone. Even in a crowded galleria, Loughridge manages to make Selina the star and focus of each page she's in with a layer of Gotham noir. From the rich colors of previous issues, Loughridge takes it down a notch and grounds the book back to the seedy underworld. From cat suit to pants suit, Selina Kyle has got it going on. With some of the Batbooks recently aiming for a younger audience, Catwoman goes right in the opposite with a more "grown up" approach. This isn't really an issue about moments that move the story, but how Catwoman is presented. It's like Valentine and company have buried the previous installments and have started laying the ground work for a really nice mansion on top of it. Valentine's sensibilities give Selina the revitalization she was in desperate need of, and the start of something new that both new readers and longtime fans can embrace. Writer Charles Soule and artist Javier Pulido just seem to be getting better together, which is bittersweet now that we know She-Hulk only has a few issues left. She-Hulk #9 is the most serious and focused issue to date, and builds on the strength of the previous issue. Centering this arc on an elderly Captain America has added weight to She-Hulk without displacing its zany streak. She-Hulk #9 is the middle issue of a three-issue arc that takes Jen and her legal team to California to defend Captain America in court. The plot thickened at the end of the last issue when Jen realized that opposing counsel was her old friend Matt Murdock. In this issue we find out what happened in 1940 to get Captain America in trouble, although the flashback raises more questions than it answers. The drably colored flashback, along with several pages of courtroom talking scenes, make this issue more constrained than usual. Muntsa Vicente’s colors inject energy into the courtroom panels, with Jen’s bright red dress popping against her emerald green skin. Charles Soule once again demonstrates his ability to write tight dialogue as he keeps us clipping along through legal language and witness testimony. As well-crafted as the flashback and courtroom pages are, it’s a welcome visual release when She-Hulk and Daredevil take a midnight run across the rooftops of Los Angeles near the end of the issue. It feels like Soule, Pulido and Vicente are glorying in the joys of comic book storytelling as She-Hulk and Daredevil glory in their superhuman strength. As the pair bounds across the city, Pulido zooms in on Jen’s profile in mid-leap and we see a grimace of frustration turn into a devilish grin. It’s a moment that represents this team’s take on She-Hulk unique mix of brains and brawn. They’ve made her wild-eyed, a little supercilious, and always full of life. After their rooftop run, Jen and Matt compare notes on Captain America and his motivations. Soule seems to be more in charge of the situation than they previously knew, but they still don’t understand any of the hows or whys. It looks like this arc will conclude next issue, when Patsy Walker will be back from some secret business conducted off-screen for Captain America. The exploration of Captain America’s status, regrets, and mortality were sound themes to match with Jen’s wit and legal smarts. Soule and Pulido has always been bursting with potential and talent, and it’s good to see that come to fruition. It’s been fun all along to watch the team develop Jen and her world through details and dialogue, but this She-Hulk run has unfolded in fits and starts. I loved She-Hulk #8, but I half expected She-Hulk #9 to be a letdown, because Soule hasn’t consistently held stories together well across multiple issues. Instead, the opposite happened. This second issue is strong and this arc feels even stronger than I hoped it would be. Readers new, old and lapsed should get in on this show while they still can. So, Wally West fans - I've got good news and bad news. The plus side is that Wally West makes his triumphant return to superheroism in The Flash #35, and what's more, he absolutely steals the show. The downside? Well... let's just say that that return is tremendously short-lived. That, my friends, is the sound of a thousand Wally West fans shrieking in terror and rage. But Wally's return is the highlight of The Flash #35, which provides a stirring conclusion to the Future Flash's first arc. After hurtling through the timestream (and lethally dispatching his foes along the way), the unhinged future Barry Allen finally comes face-to-face with his modern-day self. While Robert Vendetti and Van Jensen's script has its fair share of shakiness, the pros do outweigh the cons, as Barry Allen faces his most dangerous foe yet: himself. To their credit, once they get going, Vendetti and Jensen bring readers in fast, as Barry is swept from his breakfast and thrown into a life-or-death battle with his scary future self. There are a lot of decent ideas here, even if some of them strain your suspension of disbelief to the breaking point. It's cool, for example, to have Future Flash possess the fighting skills of Deathstroke, Lady Shiva and Batman, even if on second read you'd wonder why they'd bother training him. But the overall premise is solid - the Speed Force has been ruptured, and only the sacrifice of a speedster can cauterize it! And that's where Wally comes in. New costume and new origin aside, Wally is a breath of fresh air to this book. He's heroic, he's got a humorous streak, he's got all that impulsive drive that made him such a fun character way back in the 1980s. He's only in three pages, but by God, they are three fo the best pages in this issue. Not only does Vendetti and Jensen write the character with charm and confidence, but he also serves a great role in the plot - namely, giving the writers a third option, when the lives of two Flashes are on the line. For those who might complain at how quickly Wally comes and goes, given the time-traveling nature of this series lately, I wouldn't count Wally out of the running (ahem) just yet. Where the script falters, however, is in its dialogue - this issue is particularly tin-eared, whether its Barry congratulating himself as he pours himself a bowl of "processed grains and refined sugar--the breakfast of choice for a growing superhero," or the overwritten dialogue of the Future Flash as he explains the rupture in the Speed Force. (And modern-day Barry using "Back to the Future" as a rationale for his future self not to kill him is unintentionally hilarious.) There are a lot of weird moments of unrealistic dialogue, including Future Flash pulling a dude out a car just to berate him, or Barry unironically shouting "Full speed ahead!" You would think that showing a corrupt future version of Barry would be an opportunity for pathos, but at this juncture, Future Barry feels like he is becoming an out-and-out supervillain. The art by Brett Booth is about as utilitarian as it gets, particularly since Vendetti and Jensen set most of the book at the Salt Flats - there's no background, basically no setting, just a sterile, remote place for two speedsters the beat the hell out of each other. Booth fills in the details with blue and yellow lightning, and it does pump up the energy, even if after a bit you long for something a bit more substantial. While Booth can't save Wally West's overcomplicated new outfit, he does do some great work with the fight choreography, particularly the smirk on Wally's face as he dodges the Future Flash's blows. Ultimately, Wally West fans are going to want to take a look at The Flash #35, which brings the character back in costume and back to the fold with aplomb. While his appearance is short, it's also very sweet, and Vendetti and Jensen manage to create a satisfying ending to this time-traveling arc. With some unique cliffhangers that promise some very interesting new adventures for both Barrys, this comic is worth the read. Recasting that most maligned of X-Men in a father-son space-pirate story was a bold move that paid off for Marvel, as Cyclops became a surprise critical darling thanks to the talents of Greg Rucka and Russell Dauterman. Yet six issues later, both creators are off to greener pastures, forcing Marvel to try to capture lightning a second time, with Chew writer John Layman and recent Batman Eternal artist Javier Garron. Unfortunately, while they are both talented creators in their own right, this winds up being the wrong project at the wrong time, leaving them unable to escape the previous art team's shadow. To his credit, John Layman constructs this issue as a good jumping-on point for readers, introducing Cyclops, his father Corsair, as well as the motley pirate crew known as the Starjammers. His signature use of structure is on full display here, starting off with a brutal fight between father and son, then cutting back in time to figure out how we got there. The problem is, beyond a minor gag involving Cyclops' vomitous first experience with "Bach-terrian Versperjuice," Layman's sense of humor doesn't really shine through. (A repeated joke about Cyclops screwing up everything on the ship, for example, never really lands home.) In certain books, like Batman Eternal, a lack of humor would make sense, but this is a clear-cut case of Layman not using his secret weapon - the premise of this father-son reunion (in space, no less!) is rife with potential for laughs, and with those laughs could come some needed endearingness. On a plotting level, there's also room for improvement. The first half of the issue works as exposition and even a bit of human drama, but it ultimately winds up feeling a bit wasteful, especially since it's only 12 pages until the plot moves forward. And that's where things start to get fishy. It may be because of the lackluster reveal, and it may be because it's coming on the heels of a claustrophobic escape from a deserted planet, but the threat in this issue - a rival space pirate named Malafect - doesn't pack a lot of punch. Having Corsair beating on Scott as a diversion doesn't feel particularly clever or heart-wrenching, and while having Scott joining a rough pirate crew is a great idea (one that dates back all the way back to Robert Louis Stevenson's Treasure Island), it winds up coming across as an afterthought rather than the main hook. Perhaps more disappointing to me is the artwork. Javier Garron did a magnificent turn on Batman Eternal a few weeks back, but rereading that book, you realize that Garron's strength is in atmosphere, particularly when it comes to a character's body language and his eyes. In shadowy Gotham, this looked great, but under the antiseptic lights of the Starjammer, his characters feel flat. It doesn't help that Garron is also drawing a crew that robs him of his usual human touchstones - the lizard-like Ch'od feels stumpy, and even Cyclops himself winds up emoting through raised eyebrows and sweat because we can't see his eyes. Corsair in particular suffers the most, including one panel where it looks like his forehead is about to burst. Part of the issue is also that it feels like a mismatch between artist and color - Romula Fajardo, Jr. gave Garron some needed depth in Batman Eternal, and while Chris Sotomayor continues to kill it with the space sequences, the majority of the story is set indoors, with some downright garish background colors (to try to offset that there is a distinct lack of backgrounds throughout). Believe it or not, I usually admire John Layman's work, and was incredibly impressed with Garron during his issue of Batman Eternal, which might make this issue feel even more disappointing. Cyclops was a book that lived and died based on the talents of its creative team, rather than any of the high-concept, event-driven stuff that can get so many compulsive fans' wallets out. And with a creative team as universally praised as Rucka and Dauterman, it's hard to dispel doubts and really nail that first issue. Given that Layman and Garron are capable of great things, I wouldn't write this series off yet, but even with all that talent and promise, Cyclops #6 has hit some rocky waters.